Charles Lindbergh – or a fictional version of him – is a major character in Flying Conquistadors. He’s a fascinating individual who played a very large role in the development of aviation, and was instrumental in the early days of both Pan Am and Eastern Airlines. His legacy is, of course, complicated by his involvement with the America First Committee, which opposed U.S. involvement in what would become World War II. But those later years (I define “later” in this instance as post-1930), also marked by the tragic murder of Lindbergh’s son, are not the focus of this piece . . . or the book, for that matter. Fame came to Lindbergh in an instant. When he landed The Spirit of Saint Louis at Le Bourget Airport in France on May 21, 1927, he instantly became the world’s most famous man. 150,000 people were waiting for him that night in Paris, dragging him out of the cockpit and carrying him over their heads. When Lindbergh returned to the U.S. (he and his plane rode back on the U.S. cruiser Memphis), some 4 million people witnessed his ticker-tape parade in New York City. But Lindbergh wasn’t through flying the Spirit yet. To promote aviation – and in conjunction with the release of his autobiography, “We” – Lindbergh embarked on a Guggenheim-sponsored tour of across the United States, taking his famous monoplane to 82 cities in all 48 states. Huge crowds swarmed Lindbergh and the Spirit at every single stop. Lindbergh had first met Dwight Morrow, U.S. Ambassador to Mexico and the pilot’s future father-in-law, in Washington on his return from Paris. 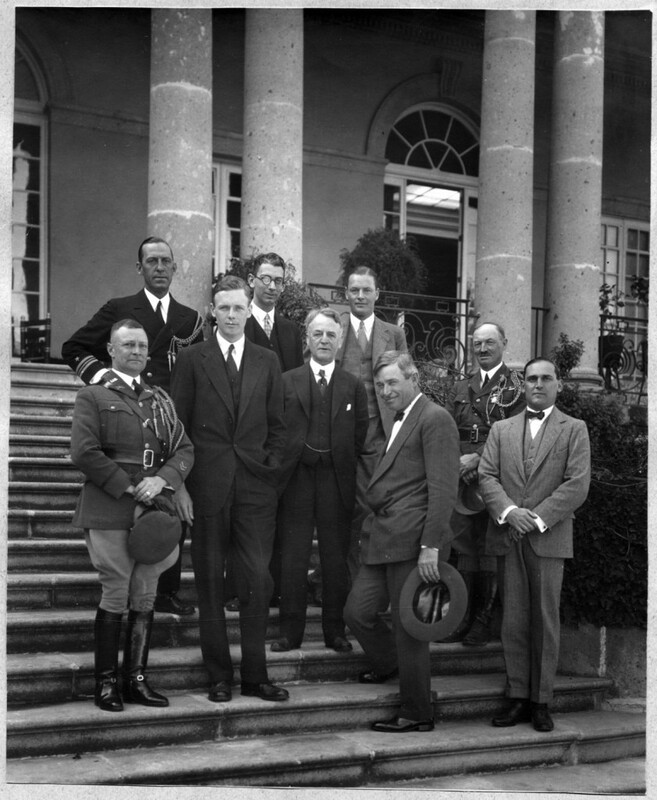 It was Ambassador Morrow who first suggested that Lindbergh do a second “Good Will Tour” to Mexico, Central America and the Caribbean. 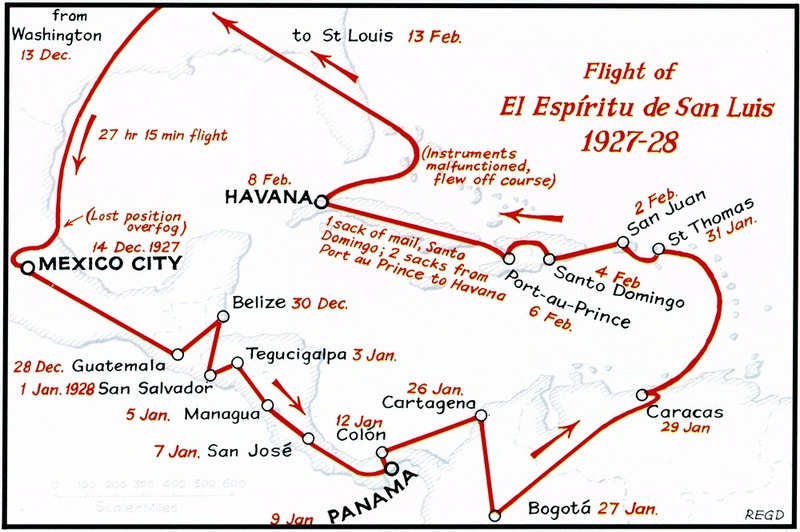 On December 13, 1927, The Spirit of Saint Louis took off on its final grand tour, flying from Washington, D.C. to Mexico City. While he may have been expecting smaller crowds outside the U.S., the opposite was the case. 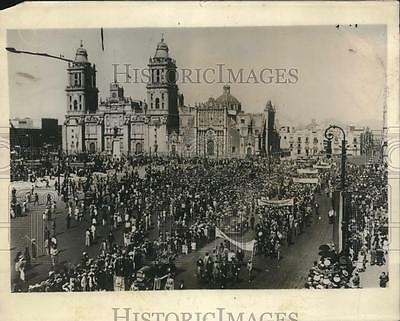 Some 200,000 people witnessed his arrival in Mexico City, which was followed by a workers’ parade with 100,000 participants and hundreds of thousands more lining the parade route. 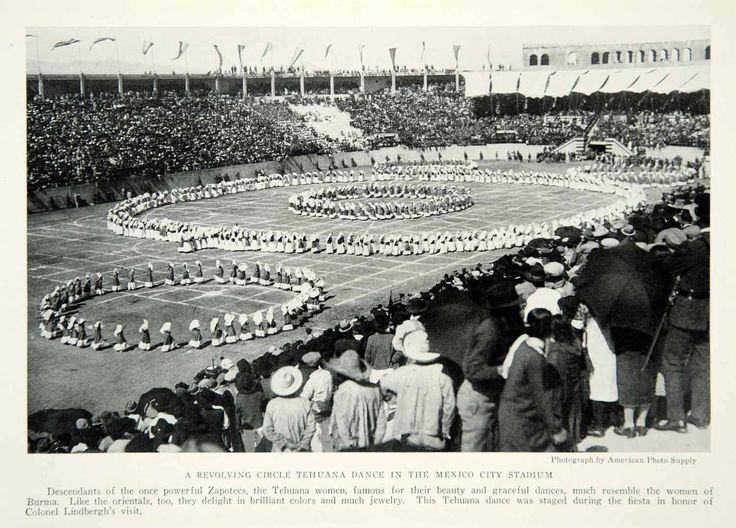 In the days that followed Lindbergh would be the star attraction at a bullfight, more ceremonies, and countless tours with dignitaries. 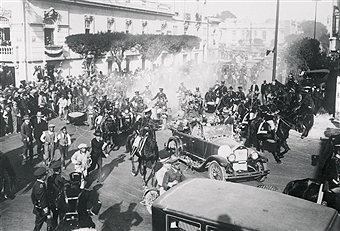 From Mexico City, Lindbergh then travelled to Guatemala where he received another rousing reception. He then flew the Spirit from Guatemala northeast toward Belize, flying over hundreds of miles over the dense jungle. 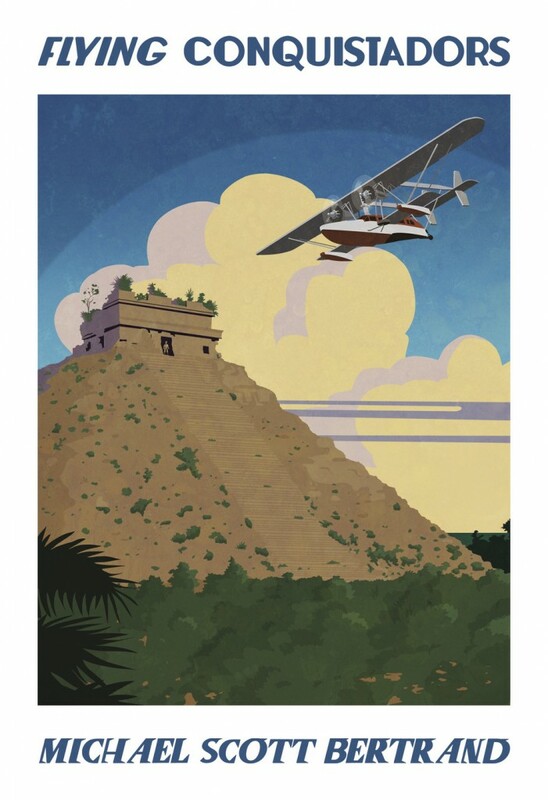 It is during this flight Lindbergh reported seeing Mayan ruins from the air. Some reports say he spotted “a white city,” while others maintained he saw “an amazing ancient metropolis.” These reports sent archaeologists into a tizzy, trying to determine in Lindbergh had identified previously unknown Mayan sites. Those sightings of ruins by Lindbergh in the Spirit inspired parts of Flying Conquistadors. 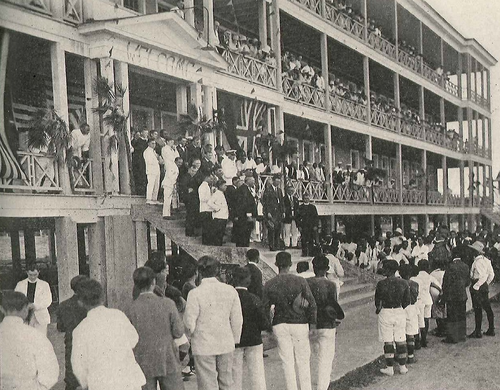 In Belize – which was the British Honduras at the time – Lindbergh was again treated like a king, and thousands turned out to hear him speak. 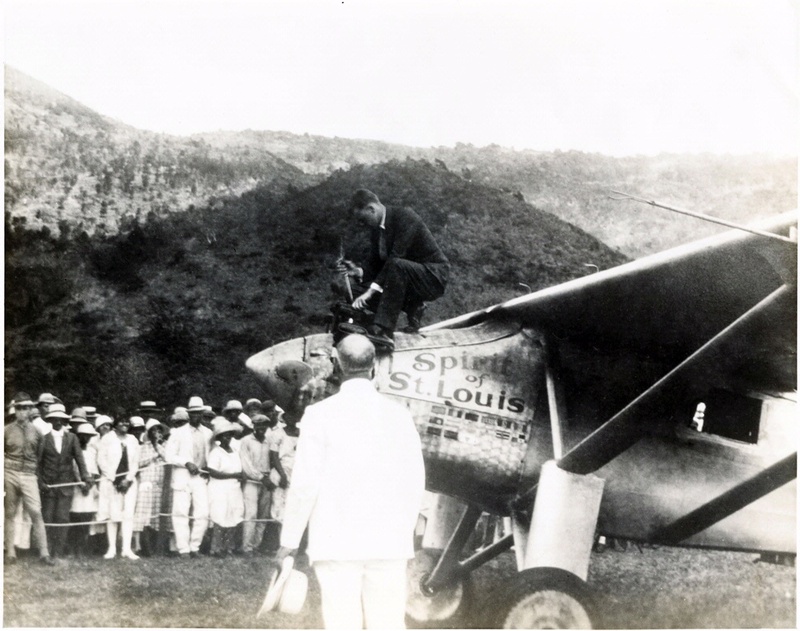 The scene would be repeated time and time again, as Lindbergh then flew the Spirit south over Central America. 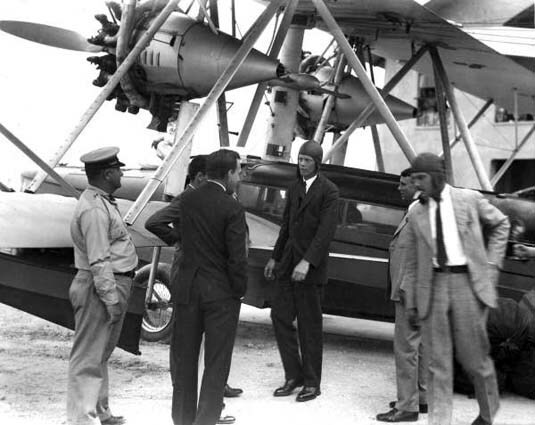 After visiting Bogota and Caracas in the final days of his epic 1927, Lindbergh flew to St. Thomas and then across the Caribbean to Havana. Over the Straits of Florida my magnetic compass rotated without stopping…. I had no notion whether I was flying north, south, east, or west. A few stars directly overhead were dimly visible through haze, but they formed no constellation I could recognize. I started climbing toward the clear sky that had to exist somewhere above me. If I could see Polaris, that northern point of light, I could navigate by it with reasonable accuracy. But haze thickened as my altitude increased…. Nothing on my map of Florida corresponded with the earth’s features I had seen…where could I be? I unfolded my hydrographic chart [a topographic map of water with coastlines, reefs, wrecks and other structures]…. I had flown at almost a right angle to my proper heading and it…put me close to three hundred miles off route! The gods of aviation looked favorably on Lindbergh that day, and he was eventually able to find Florida and made his way back to St. Louis. A few months later, The Spirit of Saint Louis would make its final flight, with Lindbergh piloting it to Washington where it would become a star attraction for the Smithsonian. 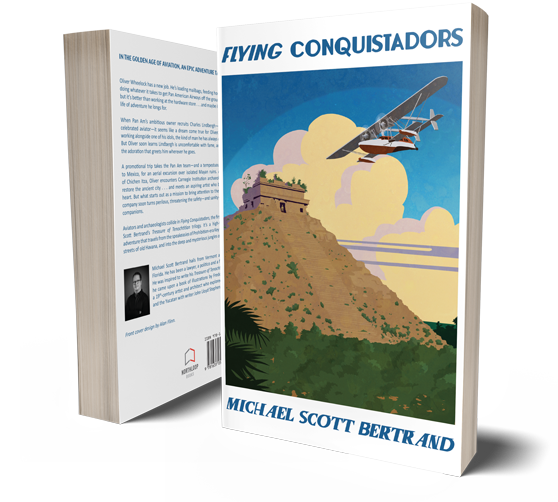 Just a few weeks until Flying Conquistadors is released! The paperback is already up for pre-order on Amazon, BN.com and my website. The e-version should be available for pre-order on those sites (and on iBooks) shortly. As I patiently await (ha!) my first book’s birthday, I figured I’d use this space to let people know more about how the book came to be. I also want to pay tribute to the real-life individuals and organizations that inspired this fictional story. We’ll start with the artwork on the front cover. The cover of Flying Conquistadors was designed by Alan Flinn (www.alanflinn.com). Alan took a rough idea I had in my head and ran with it. I was beyond pleased with the results, and since the cover was done before I was done writing the book it served as a great personal motivator! The Pyramid: Yes, that is El Castillo – also known as the Temple of Kukulcan – from Chichen Itza, located in the northern part of the Yucatan Peninsula. Chichen Itza, perhaps the most recognizable of Mayan sites, has a long and fascinating history: it was an important center of late-period Mayan culture, overflowing with ancient archaeological masterpieces. Like the rest of the Mayan world, Chichen Itza went into decline and was but a shadow of its former self when the Spanish arrived in the early 1500s. The Spaniards attempted to settle Chichen Itza themselves, only to be driven away by continued Mayan assaults. Deserted, Chichen Itza fell into decline and the jungle slowly took over. The entire site became overgrown with vegetation, the roots taking hold in between the limestone blocks laid by the ancient Maya. Over the centuries, those roots grew and pushed the limestone blocks out, and many of the structures collapsed. 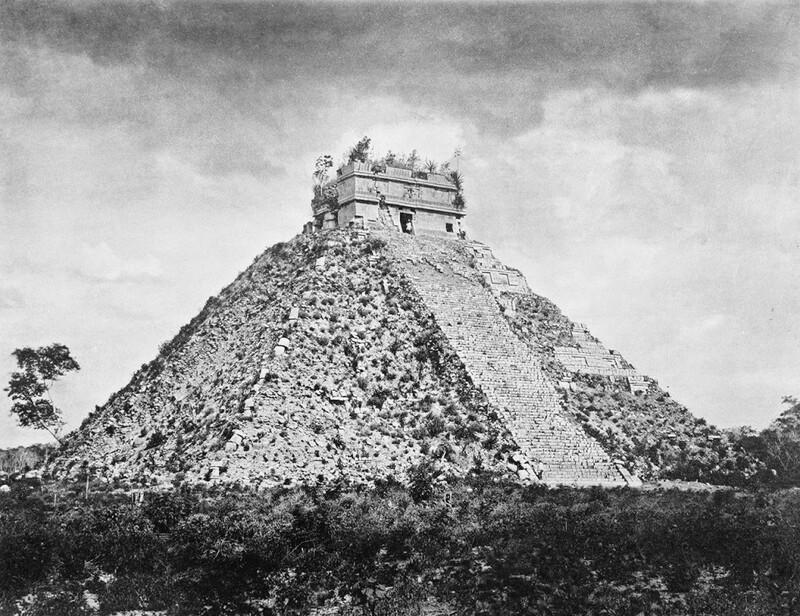 El Castillo at Chichen Itza, taken during a Maudslay expedition. I was captivated by the image of this iconic structure in its pre-restoration glory and knew it would be a good model for the cover. You can see how little trees and shrubs worked themselves into the cracks between the stones, and began to eat away at the pyramid itself. And I was intrigued by the little man standing in the doorway of the temple on top. It might be Maler, maybe even Maudslay himself. But I asked Alan to incorporate that little dude into his artwork, as it fit well with my story. (Full disclosure: Flying Conquistadors is set in the late 1920s, meaning this particular photograph predates my story by a few decades. By the time of Flying Conquistadors, the Carnegie Institution – under the direction of Edward Thompson and then Sylvanus Morley – had almost finished restoring El Castillo to the condition we are familiar with today). That beautiful bird is a Sikorsky S-38, one of the first widely produced “amphibious aircraft,” meaning it could land and take off on land or water. Pan American owned 24 S-38s, and the aircraft was indispensable as the young airline established routes throughout the Caribbean and then into South America. (Historical note: Prior to the S-38 Pan Am operated a handful of Sikorsky S-36s, a less glamorous but still functional amphibian). Despite its fame, and the fact that it was the “air yacht” of choice for millionaire and adventurers, none of the 101 original Sikorsky aircraft survived to present day. But two were “re-created” in the 1990s, and one of those two was featured in the Martin Scorsese film The Aviator. It’s the plane used in the scene where Howard Hughes (Leo) takes Kate Hepburn (Cate Blanchett) flying over nighttime Los Angeles. During that scene Hughes reaches down and pulls a pin to move the entire steering column over to the co-pilot’s side, giving Hepburn a surprise flying lesson. That movable steering column was a feature unique to the S-38. Interestingly, a few years ago the owner of the replica plane used in The Aviator was able to use his S-38 for a transatlantic crossing, taking advantage of some strong tailwinds. My understanding is the plane is now in storage in Florida (note to family: would make a great gift!). The S-38, despite its modest cabin size, played an outsized role in helping Pan Am during those early days. 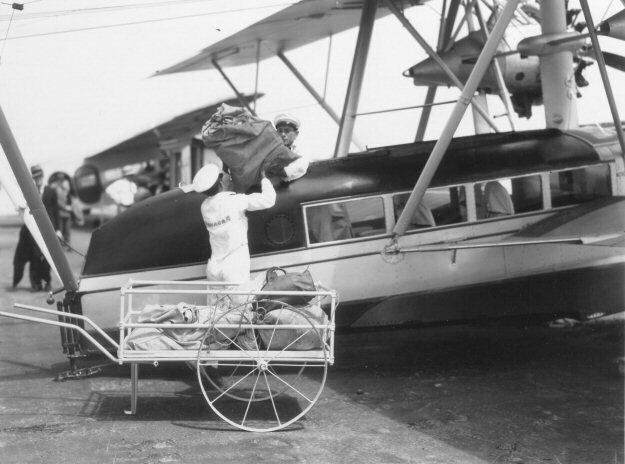 Getting into it was no easy feet: the hatch for the passengers was located on top of the plane, requiring airline crew to have ladders at the ready. But it was an important milestone in the development of passenger-focused aircraft, and it allowed Pan Am to establish regularly-scheduled flights to locations that didn’t (or couldn’t) have a landing strip. The success of the S-38 led to the creation of the bigger S-40, the first “true” Pan Am Clipper, and those Clippers would in turn revolutionize air travel in the Americas and beyond. 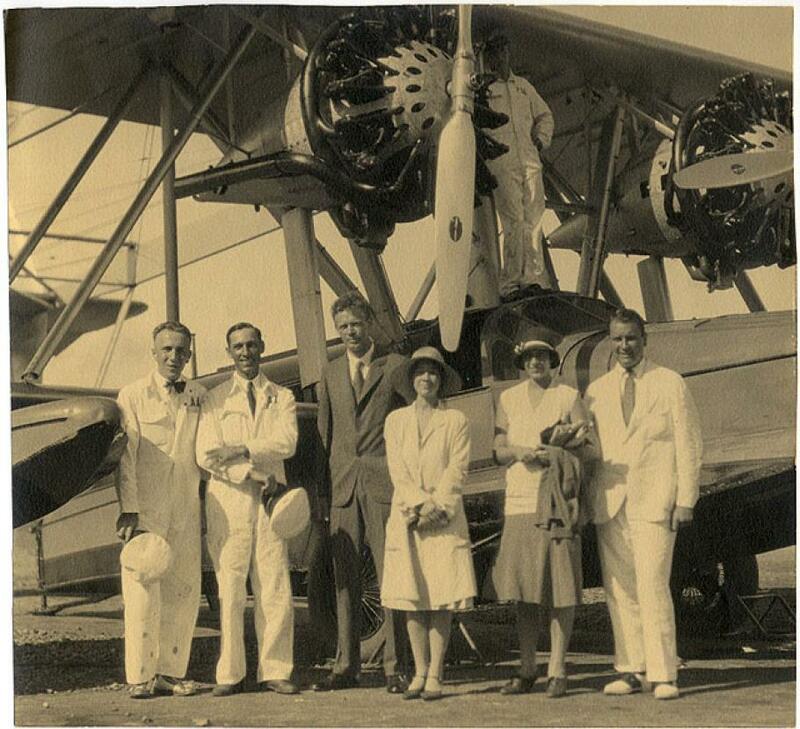 Charles Lindbergh was a frequent operator of Pan Am’s S-38s, not just for mapping out the early routes but also for more relaxing pursuits. He used an S-38 to take Doctors Kidder and Ricketson from the Carnegie Institution on that first archaeological reconnaissance mission over Central America and the Yucatan. 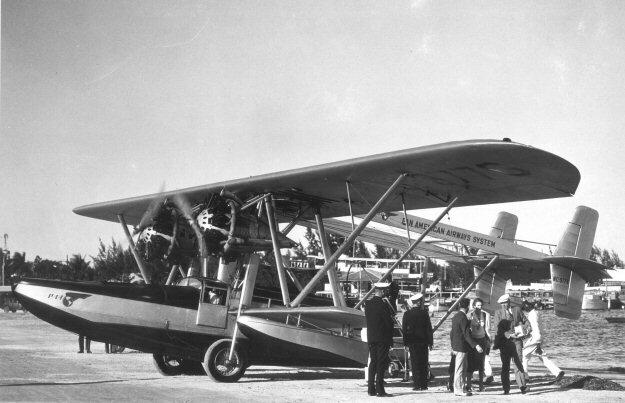 Later, after his marriage to Anne Morrow, the Lindberghs and the Trippes used S-38s to tour around the Caribbean and Central America, including the Panama Canal. It’s a fascinating airplane from a fascinating time in history, and if you are interested in learning more about the S-38 you can find a wealth of resources online. And if you want to see the S-38 in action (and in full living color) click here! That’s all for today, class . . . remember Flying Conquistadors will be released on March 28th! Thanks for reading! New Release Special! SWORD OF THE SPANIARD for 99 cents! Enter the Flying Conquistadors Goodreads Giveaway!